Buzz Aldrin took the first EVA selfie in 1966. A space selfie is a selfie (self-portrait photograph typically posted on social media sites) that is taken in space. 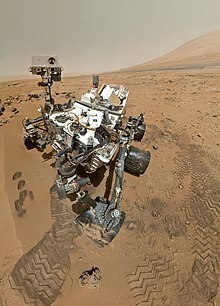 This include selfies taken by astronauts (also known as astronaut selfies), machines (also known as space robot selfies and rover selfies) and by an indirect method. The first known space selfie (during an EVA - an earlier shot inside the capsule was taken on Gemini 10 by Michael Collins) was taken by Buzz Aldrin during the Gemini 12 mission. The extra-vehicular activity (EVA) equipment used by astronauts during spacewalks contains a specially designed camera for photography in outer space. The main purpose of the EVA camera is to take pictures of the subjects related to the missions. There have been many space selfies, some of which use the visor of another astronaut's helmet as the mirror. Early space selfies after the word "selfie" was first used in 2002 without assistance from another astronaut included Donald Pettit and Stephen Robinson. Pettit took one during the Expedition 6 in January 2003. Robinson took his during the repair of the Space Shuttle Discovery on August 3, 2005, as part of the STS-114 mission. Another notable space selfie was taken by Japanese astronaut Akihiko Hoshide during the six-hour, 28-minute spacewalk on September 5, 2012. Hoshide's photo became a viral phenomenon after Commander Chris Hadfield uploaded the photo to his Twitter account on September 30, 2013. Coincidentally, Oxford University Press, the publisher of the Oxford English Dictionary, announced in November 2013 that "selfie" was the word of the year for 2013. The picture topped many selfie lists of the year. Another space selfie of Hoshide also showed up on Instagram and appeared on a list of top selfies of 2013. Space selfies can be dated back to 1976 when the lander of the Viking 2 mission took the photo of its deck after landing on Mars; however they were not considered by Discovery News as true selfies in its list of top 10 space robot selfies. An unusual approach was taken in 2010 by IKAROS, launched by Japan Aerospace Exploration Agency (JAXA) it included two wireless cameras that were ejected out of the spacecraft for the sole purpose of taking "hand free" space selfies. A blog entry about the photos was posted in 2010 and the link was posted on Twitter in 2013. Curiosity, which landed on Mars in 2012, was equipped with the Mars Hand Lens Imager (MAHLI) camera. It can maneuver its robotic arm and turn the attached camera around to take its head shots. Discovery News described the maneuver as the way to take a truly authentic selfie and gave it the title King of Selfies in 2013. Hello, Gorgeous! Snapped this self portrait while inspecting my MAHLI camera with its dust cover intentionally left on. This was a test to make sure the cover, its hinge the area it sweeps when it opens are clear of debris. 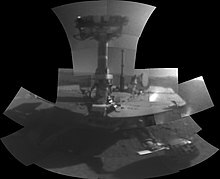 In February 2018 the Opportunity rover used its MER Microscopic Imager to take a selfie to mark 5000 sols on Mars. The MER Microscopic Imager has a fixed focus and a fairly narrow field of view resulting in the sefie having to be made up of a series of stitched, out of focus shots. In order to reduce the amount of data that needed to be transmitted the images were scaled down in size and compressed before being transmitted from the rover. This was the first time images from the MER Microscopic Imager had been scaled down by the rover. On June 22, 2007, DARPA's Orbital Express spacecraft captured perhaps the first space selfie by an autonomous robot. Taken near the end of mission on July 22, 2007, the selfie was intended to capture a family portrait of the two spacecraft in a mated configuration. The selfie shows the ASTRO "servicing satellite" at left, and the NEXTSat "client satellite" at right. The robot arm used to capture the selfie can be seen in white at the bottom of the frame. The photo has a dark, high-contrast quality to it due to the use of the arm-mounted camera, not intended for general photography, but used to autonomously track and acquire the NEXTSat. During a brief period, an alternative method was presented as available by which a person could, without being in outer space, indirectly take space selfies. This was promoted as part of the crowdfunding efforts for the Planetary Resources's ARKYD mission. The ARKYD "space selfie" method would have allowed donors to upload their own photos to the telescope orbiting the Earth; the telescope would have had a robotic arm equipped with a camera and a small screen to display the picture of the donor on one surface of the telescope, and the on-screen image of the donor was to be visible to the lower part of the camera (with the Earth as the background) allowing a space selfie to be taken. A similar service was launched in 2014 by Belgian startup SpaceBooth. The SpaceBooth Low Earth Orbit pico-satellite will project uploaded images in front of a transparent window and then take a picture of the projection with space in the background. The space selfie will then be sent back to the Earth. SpaceFab.US, a U.S. startup, is currently offering space selfies on their Waypoint-1 satellite launch, scheduled for late 2019. ^ Chang, Kenneth (23 February 2015). "Rarely Seen Images From Space Including the 'Best Selfie Ever'". New York Times. Retrieved 23 February 2015. ^ a b c Fears, Danika (18 November 2013). "Oxford Dictionaries names 'selfie' word of the year". TODAY News. Retrieved 29 December 2013. ^ "The 50 Best Space Photos of 2013". AOL Weather. Archived from the original on 27 December 2013. Retrieved 27 December 2013. ^ Borkar, Neha (21 November 2013). "Top 10 Most Popular Selfies". India Times. Retrieved 27 December 2013. ^ "Ancient Mars lake may have supported life". Associated Press. 9 December 2013. Retrieved 27 December 2013. ^ a b c O'Neill, Ian (5 December 2013). "Top 10 Space Robot 'Selfies': Photos". Discovery News. pp. 1, 2, 10. Retrieved 27 December 2013. ^ Mann, Adam (2 November 2012). "High-Res Curiosity Rover Self-Portrait Is Mind-Blowing". Wired Magazine. Retrieved 27 December 2013. ^ Howell, Elizabeth (11 June 2013). "'Space Selfie' Telescope Could Hunt Alien Planets ... If It Raises A Cool $2M". Universe Today. Retrieved 27 December 2013. ^ "Did you know I took the first space selfie during Gemini 12 mission in 1966? BEST SELFIE EVER". Buzz Aldrin (Twitter). Retrieved 21 July 2014. ^ "IMAGE: Nikon F5 EVA Camera New Space Walk Camera". NASA. Retrieved 27 December 2013. ^ Howell, Elizabeth (3 October 2013). "Best Ever Astronaut 'Selfies'". Universe Today. Retrieved 27 December 2013. ^ "Self-portraits and social media: The rise of the 'selfie'". BBC News Magazine. 6 June 2013. Retrieved 27 December 2013. ^ "STS-114 Shuttle Mission Imagery S114-E-6338". NASA. Retrieved 27 December 2013. ^ "International Space Station Imagery ISS032-E-025258". NASA. Retrieved 27 December 2013. ^ Day, Elizabeth (13 July 2013). "How selfies became a global phenomenon". The Guardian. Retrieved 27 December 2013. ^ "Chris Hadfield Tweets A Selfie In Space (PHOTO)". The Huffington Post Canada. 30 September 2013. Retrieved 27 December 2013. ^ Hui, Sylvia (19 November 2013). "Oxford Dictionaries: 'Selfie' is word of the year". The Detroit News. Archived from the original on 27 December 2013. Retrieved 27 December 2013. ^ "Seven of the best selfies you will see today: As selfie is named word of the year, we round up seven of the best". Metro. 19 November 2013. Retrieved 27 December 2013. ^ "Obama caught snapping 'funeral selfie': Craziest selfies of all time". NY Daily News. Retrieved 27 December 2013. ^ Gordon, Naomi (11 December 2013). "8 surprising celebrity selfies: Pope Francis, Darth Vader and the Obamas". Digital Spy. Retrieved 27 December 2013. ^ a b Ulivi, Paolo; Harland, David M (2009). Robotic Exploration of the Solar System Part 2 Hiatus and Renewal. Praxis Publishing. pp. 218–219. ISBN 9780387789040. ^ Madrigal, Alexis (10 September 2012). "Mars Curiosity Rover Takes a Selfie". The Atlantic. Retrieved 1 January 2014. ^ Trei, Michael (10 September 2012). "Pictured: Curiosity takes first ever Mars 'selfie'". DVICE. Retrieved 27 December 2013. ^ Kalinchuk, Andrew (9 September 2012). "Mars rover, Curiosity, takes a self-portrait and shares it with the world". Digital Trends. Retrieved 1 January 2014. ^ "Rover Takes Self Portrait (ID#: PIA16149)". NASA/JPL-Caltech/Malin Space Science Systems. Retrieved 27 December 2013. ^ "Facebook status". NASA’s Curiosity Mars Rover. Retrieved 1 January 2014. ^ "@MarsCuriosity Twitter status". Twitter. Retrieved 29 December 2013. ^ "'Selfie': the interplanetary Word of the Year 2013". Oxford University Press. Retrieved 29 December 2013. ^ a b c d Ellison, Doug (20 April 2018). "The Opportunity selfie: 5000 Sols in the making". Planetary.org. The Planetary Society. Retrieved 7 June 2018. ^ a b c "On-Orbit Mission Updates". archive.darpa.mil. Retrieved 2018-08-01. ^ "Orbital Express". archive.darpa.mil. Retrieved 2018-08-01. ^ "Planetary Resources raises $1.5m on Kickstarter to let you take selfies from space". Financial Times. 19 July 2013. Retrieved 27 December 2013. ^ Tickle, Glen (22 June 2013). "Crowdfunded ARKYD Space Telescope Lets You Put Your Face in Space, Take Space Selfies". Geek System. Retrieved 27 December 2013. ^ "Space Exploration Company Planetary Resources Cancels 'Space Selfie' Kickstarter-Backed Project". ^ "SpaceBooth FAQ" (PDF). Archived from the original (PDF) on 2014-03-27. This page was last edited on 6 April 2019, at 13:52 (UTC).